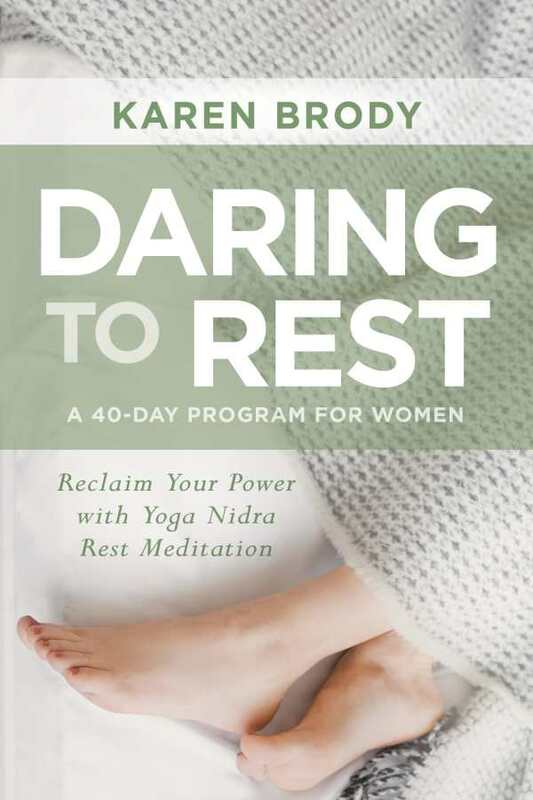 Karen Brody’s encouraging book Daring to Rest shares how a deep form of meditation called yoga nidra can help women—who suffer twice the number of sleep and wakefulness disorders as men—reclaim true restfulness. The solution to fatigue, Brody argues, isn’t simply to get more sleep. Rather, people need to truly rest—in body, mind, and spirit. The forty-day program presented in the book, complete with links to recordings of guided meditations for practice, seeks to give that comfort to women. Yoga nidra is not literally sleeping, but rather a mindful settling down into deeper levels of the self: the physical, energy, mental, wisdom, and bliss bodies. Meditation guides movement through these “bodies,” propelling one toward their authentic, rested, and powerful true self. Brody’s guide to this form of meditation, sometimes called a “yoga nap,” reads quickly. It is engaging and insightful, and it makes the experience of recuperating from a lack of rest sound easy. Daring to Rest will give women hope that they can heal even in the midst of their busy lives, and ultimately feel more energetic.